Scary Monsters and Super Creeps: An Appreciation of Steve Ditko – Dork Forty! So I’m sure that, if you’re reading this, you’ve heard about the passing of Steve Ditko. A true giant of comics, Ditko stands in a position sort of opposite Jack Kirby in the funnybook pantheon. If Kirby is a pugnacious Thor, the god of a feisty heroic ideal, then Ditko is a nervous Hades, the god of dark obsessions and paranoia, his art best-suited to supernatural horror and shadowy urban crime drama. It seems ironic, then, that his most famous creation is the wisecracking jokester hero Spider-Man. Or… Maybe not. Has there ever been a more put-upon super hero than Spider-Man? Hated and feared more than loved, Spidey’s joking covers up a nervous disposition and basic insecurity. Brave, but driven by deep-seated guilt and a secret fear that he’s really a jerk at heart, Peter Parker would go batty in the face of the insane dangers he faces if he didn’t constantly crack jokes. And who can blame him, really? I mean, have you ever really looked at that early Spider-Man rogues’ gallery? Those are some creepy bastards! Just LOOK at some of these guys! What’s that? Don’t think a fat guy with mechanical arms is creepy? THINK AGAIN! That’s the best thing about Doc Ock, I think. He’s only a little creepy, visually. But emotionally, he’s the grand poobah of creeps! …and Dr. Strange gave him ample opportunity to draw all of it. I think the strip’s brevity helps it a lot, too. As one-half of the split book Strange Tales, most of Ditko’s Dr. Strange chapters are around 10 pages long, and that propels the story forward at breakneck speed. The early, more sedate “occult detective” stories suddenly open up and give way to an epic cosmic serial, one of the longest of the era, running something on the order of 18 issues beginning to end. Before it’s all said and done, Strange has fallen in love, fought off multiple arch-foes, ascended to the office of Sorcerer Supreme, and witnessed a battle that threatens the very fabric of reality itself! And that, again, is all Ditko. He created the character, and started plotting the strip even earlier than he did Spider-Man, though he again didn’t receive credit for that til later. But even that notorious glory hound Stan Lee admits that his only input was pretty much just writing dialogue. Stan’s sharing of credit was too little, too late, though. Their clashes over changes Stan was making to Spider-Man, coupled with Ditko’s increasing dissatisfaction with his credit and his pay, lead Ditko to stop talking to Stan and, eventually, to quit Marvel Comics altogether. That’s also probably to the comic’s benefit, though. Unlike Jack Kirby on Fantastic Four, who continued doing the book long past the point when (for the same reasons) it had become just a job to him, Ditko left Dr. Strange while his passion for the work was still strong. So while there’s a lot less of it, the work we do have is all killer, no filler. Of course, this is not to imply that Ditko burst on the scene fully-formed in the early 60s at Marvel, either. His penchant for weird, spooky visuals and surrealistic vistas was something he developed on a seemingly endless series of horror, crime, and sci-fi shorts throughout the 1950s. …to my way of thinking, his most interesting post-Marvel work comes in the black and white horror shorts he turned out for Warren titles like Creepy and Eerie. An attempt to recapture the spark of the 1950s EC Comics line, Warren got around the restrictions of the Comics Code by publishing in magazine format. Though the pay wasn’t great, the creative freedom was, and Warren was able to attract some impressive young talent because of it. Archie Goodwin wrote and edited tons of stuff for Warren early in his career, for instance. And for a prickly veteran like Ditko, given to weirdness and experimentation, it was a perfect place to make some dough while expanding the scope of his art. Because Warren, not having the benefit of publishing in color, was big on ink wash to lend their publications texture. And this was a technique Ditko excelled at. It really is my favorite Ditko art. The stories are hit and miss. Like all the Warren stuff, they’re a mix of inventive twist-ending horror and salacious sensationalism. But Ditko seems energized on them. His lines are sharp, his figures tight, and the washes really play to his talent for creating mood and tone. It’s just beautiful stuff. While tracking down old issues of Creepy isn’t the easiest task in the world, there is a collection of it out there, under the title Creepy Presents Steve Ditko, and if this stuff is interesting to you at all, I highly recommend it. Of course, the Warren stuff was just where Ditko was flexing his artistic muscles. His intellectual side was being given a work-out in the same period over in the pages of Wally Wood’s “ground-level” comics magazine for adults, Witzend. A fellow funnybook ne’er-do-well, Wood was inspired by the underground comics of the 1960s to create a place for his fellow comics pros to give full, uncensored vent to whatever they had in their heads that mainstream comics publishers wouldn’t touch. For most of them, that seems to have largely involved graphic violence and nekkid women. But for Ditko, it was a chance to explore his increasing fascination with the teachings of Ayn Rand, in the form of Mr. A. Sort of an objectivist version of his Charlton Comics character The Question (another fascinating post-Marvel super hero creation), Mr. A believes only in extremes. In maybe his most notorious adventure, he lets a petty criminal fall to his death, when he could have saved him, because by Mr. A’s strict black and white morality, the man didn’t deserve to live. This, increasingly, became the sort of work Ditko did in the last 40 years of his career, self-publishing comics outlining his philosophies, and presenting the adventures of various increasingly strange super heroes whose lives serve as object lessons in those philosophies. This is the most vital work of Ditko’s later career, the place where most of his energy and artistic effort went. I find this stuff fascinating, and can’t help but admire it on some level. Steve Ditko was a man of very high and very strict principles, and that is something worth acknowledging. But at the same time… Yes. Most of this stuff seems a little nuts. Political / philosophical diatribes usually do. What can I say? I don’t much agree with the man’s ideas. But I’m mesmerized by the way he expressed them. Now, he also continued to take on mainstream comics gigs throughout the 70s and 80s, work that kept him fed and allowed him to do his more personal work on the side. 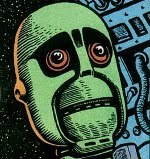 There were horror shorts for Charlton, fill-ins and pin-ups all across the industry, and even extended runs on books like Machine Man, Rom: Spaceknight, and Shade the Changing Man. But you’ll notice I’m not sharing any images from this stuff. And that’s because there’s a definite lack of enthusiasm to most of it. Shade had some inventive moments, but for the most part, the visual and psychological depth of his earlier work is almost entirely absent. It has the feel of work done just to pay the bills. Professional, but uninspired. Steve Ditko was my first favorite artist. I discovered him with the Pocket Books reprints of the early Spider-Man comics, each page individually shrunk down to the size of a dime store paperback. It’s a terrible, muddy way to reproduce that great work. But, god, I loved it. Those comics still don’t look right to me at full size. I’ve got the big, fancy Omnibus reprint of his entire run, and it’s just as good as it ever was. But I can barely stand reading it. It’s too big, too… open. Those are cramped comics to me, tiny and obsessive, and they need… they fairly cry out… to be crammed onto the page in as small a space as possible. It adds to the neurotic fever dream quality of them, and is just so… damn… Ditko. Solid, solid article man. And you can never go wrong with a good David Bowie reference either. Excellent post, Mark! I appreciated your analysis of just what both Ditko and Lee each brought to the Spider-Man series. Both men were important to the character’s success, but in very different ways. And nice look back at some other great parts of Ditko’s career. I also like his Doctor Strage stories a lot. Thanks for this great personal retrospective of Ditko, Mark. I especially appreciated the generous and varied selection of artwork. I didn’t know Ditko co created Dr. Strange. Still an amazing Artist in that Hall of the greatest. My second favorite comic artist. I collected all the Horror titles and reprints and many Charltons You are right about ROM. Thanks for the thoughts He will be missed. Thanks for the kind words, everyone! I’m glad you enjoyed it.